SUMMER EXCHANGE - Buffalo-Dortmund Auslandsgesellschaft.de e.V. The summer exchange program takes place over two subsequent summer breaks, e.g. 2017 in Buffalo and 2018 in Dortmund. The first summer German students will fly to New York City and after a brief stay they will make their way to Buffalo. They will be housed with American students for approximately two weeks. The students will participate in family life as well as join both German and American students for excursions in and around Western New York. The program includes trips to Niagara Falls, Darien Lake Themepark and/or Ellicotville Sky High Adventure Park. Furthermore, the group will be able to enjoy visits to Buffalo Canal side, or City Hall with a meeting of Buffalo’s Mayor, as well as several get-togethers and barbecues. At all time traveling chaperone Dan Scanlon and team leader Lynn Engle will be with the group. 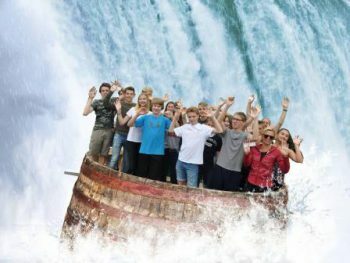 Group of 2017 at the Niagara Falls © Auslandsgesellschaft NRW e.V. 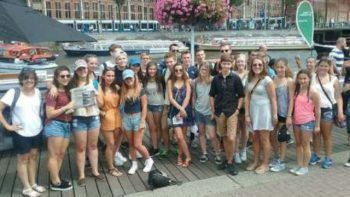 The following summer, American high school (ages 14-17) students visit Germany in return. Ideally, the American student stays with the family of their former host student. Since it is only obligatory for Dortmund’s students to participate in both years’ programs, there might be Buffalonians yet unknown to the group. Integration has never been a problem though. Upon arrival in Dortmund the American group is welcomed at the International Institute, where the students meet their host families. In Dortmund the group will visit City Hall, the soccer stadium and other sights. The group will be able to enjoy several day trips to cities near Dortmund, for example Düsseldorf, Cologne and/or Amsterdam in the Netherlands. Furthermore the group travels to Berlin for three days. Check Point Charlie, the Berliner Dungeon, the Bundestag and the Brandenburger Tor are on the agenda. 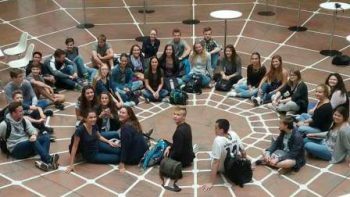 From departure to Germany to arrival back in the US, students are chaperoned by a qualified American teacher of German (Lynn Engle), who provides the support students need when they are away from home. In Germany there is an additional German supervisor with the group at all times. Since summer break in Germany lasts only six and a half weeks and varies from year to year due to federal regulations, the program takes place sometime around late June and early September. Most often, the three weeks are set in July/August. For German adolescents it is obligatory to participate in both exchanges. Buffalonians can enroll for only one summer, but they are welcomed and encouraged to participate in both years’ programs as well.